Malaysia Airlines (MAS) flight MH17 was travelling from Amsterdam to Kuala Lumpur on July 17 when it was shot down over Ukraine. 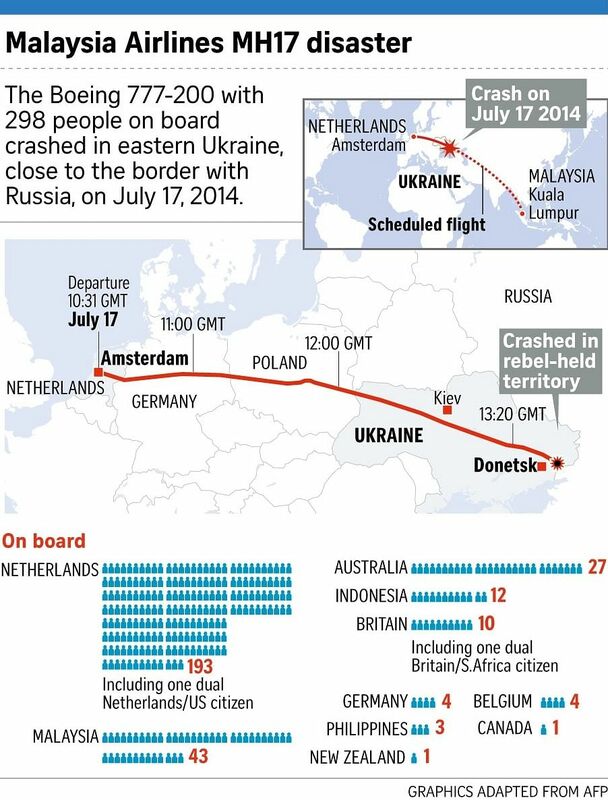 All 298 passengers and crew - mostly Dutch, Malaysians and Australians - were killed. The crashed plane was a Boeing 777-200ER, the same model as MAS flight MH370 which disappeared while travelling from Kuala Lumpur to Beijing on March 8, 2014. The aircraft, manufactured in 1997, had a clean maintenance record and its last check was on July 11, the airline said. There was no distress call before the plane crashed. MH17 departed from Amsterdam's Schiphol Airport at 1031 GMT (12:31 local time) on July 17 and was due to arrive at Kuala Lumpur International Airport at 2210 GMT (06:10 local time). In its preliminary report, the Dutch Safety Board said the plane lost contact with air traffic control at around 1320 GMT, when it was about 50km from the Russia-Ukraine border. MAS had initially said that the plane lost contact at 1415 GMT. The crash site was in territory controlled by pro-Russian separatists. The preliminary report said MH17 broke up in mid-air after being hit by "numerous objects" that "pierced the plane at high velocity" from outside the cabin and above the level of the cockpit floor. Western nations said there was growing evidence that the plane was hit by a Russia-supplied missile fired by rebels. US officials from the Office of the Director of National Intelligence said there was a "solid case" that a SA-11 missile - also known as Buk - was fired from eastern Ukraine under "conditions the Russians helped create". They said the rebels may have mistaken the plane for another aircraft. Evidence included images purportedly showing a surface-to-air missile launcher in the area, analysis of voice recordings of pro-Russian rebels apparently admitting bringing the airliner down and social media activity pointing to rebel involvement. The evidence also included satellite images of a facility allegedly used to train rebels near the Russian city of Rostov. Russia denied all allegations that it supplied weaponry to the rebels and instead suggested that a Ukrainian military plane had flown within firing range of the airliner just before it came down. The Ukrainian government rejected the claims. What about the black boxes? The recorders, said to be "in good condition", had been sent to the United Kingdom for analysis. They store key technical information about the flight as well as conversations in the cockpit. According to the Dutch Safety Board, the flight data recorder showed that "all engine parameters were normal for cruise flight" until the recording "stopped abruptly at 13:20:03 hrs". No spoken warnings were found on the cockpit voice recorder. The Dutch investigators said there was no evidence that the flight recorders had been tampered with. When will the final technical report be ready? Malaysian Prime Minister Najib Razak said the Dutch Safety Board is expected to publish its final report in early October. What's being done to prosecute those responsible? The chance of a successful prosecution is considered slim at best, but the Netherlands, Malaysia and Australia are hoping to push for an international tribunal to prosecute those suspected of downing the airliner. They hope that by pushing for a UN-style court with the backing of Western allies, they could pressure Russia, whose role in the process is critical, into cooperating. Malaysia, part of the 15-member UN Security Council, distributed a draft resolution on the tribunal on July 8, which it hoped could be adopted later in July. It is a joint proposal with Australia, the Netherlands, Belgium and Ukraine. The draft UN resolution would "establish an international tribunal for the sole purpose of prosecuting persons responsible for crimes connected with the downing of Malaysia Airlines flight MH17." It says "that in the particular circumstances of this incident, the establishment of an international tribunal would be an effective guarantee for an independent and impartial accountability process." However, the move has been dismissed by Russia, which is a veto-wielding permanent member on the 15-member council, along with France, Britain, China and the United States. Russia has the option of blocking the proposal if it is put to a vote.